Price gun label manufacture has been our mainstay business since our inception in 1987. Starting out as a print bureau, the staff at Positive ID Labels built up the business until it was sensible to buy our first Mark Andy press in 2003. Since then we have continued to grow and bought and replaced several more label gun label printing presses. We now run 4 Mark Andy narrow web printing presses dedicated to price gun label manufacture and nothing else. We can manufacture your bespoke price gun labels to order or you can buy generic labels directly from our warehouse stock. Stock labels include blank, coloured, use by labels, best before labels or best before batch labels (used in 2 line label guns). Labels from stock are supplied in boxes of 45,000 labels (30 rolls generally). Bespoke label gun labels printed to order are subject to a minimum order quantity of 90,000. Price gun labels are generally made on vellum material which is a matte paper. We can colour this in-house to your requirements or we can buy in fluorescent materials such as yellow, green, red, orange or pink. These give really high impact and visibility for pricing purposes. Price gun labels are manufactured on three types of adhesive: peelable – ideal for gifts and the like where the label should be removed. Permanent (sometimes called ‘universal’ adhesive); these labels cannot be removed easily from most surfaces. These are ideal for date labels and the like. Finally, Freezer adhesive is a strong adhesive with good grab properties on frosted surfaces – suitable for products intended to be frozen. We make more single line price gun label labels than any other product; over 100 million per year. 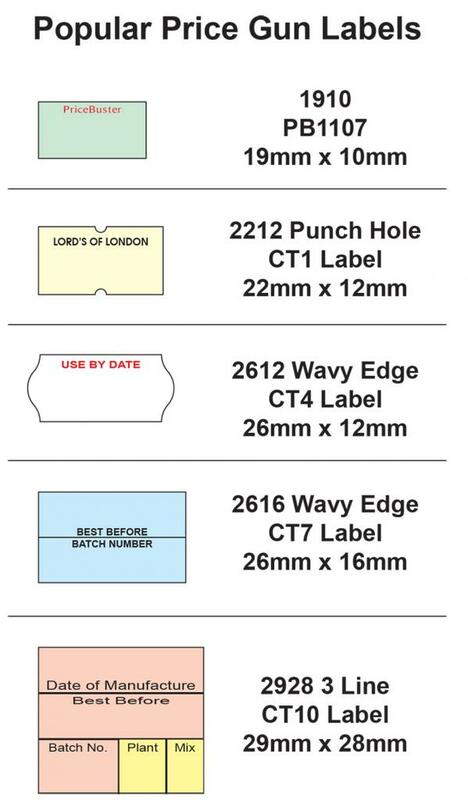 These labels are known as either one line labels, 26 x 12mm labels or CT4 labels. The labels have a wavy edge and can be found indicating prices for products in most small shops and outlets. The one line labels fit in our range of Swing C6, Swing C8 and Swing S10 pricing guns as well as Open C6, Open C8 and Open S10 price guns and many other makes and models of labelling guns. We also make huge numbers of 2210 Punch Hole labels for Danro 2210PH label guns. These are available plain ex. stock or made to order. We manufacture price gun labels for popular Open and Swing 2 line price guns. These have two rows of characters and come in a variety of configurations including numeric, alphanumeric or numeric and date configurations. We supply popular Swing C17 and Swing C20 label guns along with premium class Open Data label gun equivalents such as Open C17, Open C20, Open C20A, Open CA20A. Labels for these price guns are manufactured on our Mark Andy presses in any combination of background and text colours, materials and adhesives. The Open T111 label gun has three lines with 10 characters in each line. The Open T117 label gun has the upper two lines with 10 characters and the bottom line with 7 characters. These use 29mm x 28mm CT10 labels and can be pre-printed to convey a multitude of data. Prized in medical applications for quick and easy labelling of batch labelling processes. We can also manufacture three line label gun labels suitable for use in the Open T111 or Open T117 three line label gun.